Direct-to-Consumer Genetic Testing Market size was valued at USD 601.5 million in 2017 and is expected to witness more than 18% CAGR from 2018 to 2024. Growing patient demand for service personalization in developed economies such as North America and Europe will boost the demand for DTC genetic testing for detection of various genetic and rare diseases during the forecast period. Demand for service personalization to provide tailored medical treatment to individual patient based on their molecular basis is increasing in recent years. This reduces the risk of potential negative side effects triggered by medicines and treatments by prescribing medication specific to individual’s genetic makeup. DTC predictive testing segment accounted for USD 110.8 million revenue in 2017 and is expected to witness significant growth over the analysis timeframe. Ability of predictive tests to provide information regarding likelihood of acquiring certain diseases at a later stage in life increases its adoption among the consumers. Increasing awareness among people pertaining to early disease detection to undergo timely treatment and minimize the severity of diseases will further foster segment growth in the coming years. DTC carrier testing segment is projected to show robust growth with a CAGR of 19.8% during the forecast period. Carrier testing is primarily done before or during pregnancy to determine whether an individual is a carrier of certain genetic disorders. As per the Centers for Disease Control and Prevention (CDC), each year about 3% of all the new-borns in the U.S. are affected by some or other birth defects resulting in infant mortality. This will increase the adoption of carrier testing among the pregnant women, to determine the risks of child inheriting one of genetic disorders after birth, thereby augmenting the segment growth. Single nucleotide polymorphism (SNP) chips segment will grow at a CAGR of 18.6% during the forecast years owing to rising prevalence of chronic and rare diseases across the globe. Growing reliance on SNP chips due to its ability to target approximately 1 million sites of known genetic variation will spur the market size in the coming years. Increasing usage of SNP chips to provide information about risk for common and rare diseases is expected to escalate the segment growth during the analysis period. Whole genome sequencing (WGS) segment was valued at USD 77.8 million revenue in 2017 and will witness considerable growth by 2024. The segment growth is attributed to the ability of whole genome sequencing technology to examine entire human genome and provide information regarding majority of variation present in individual genome. However, high price associated with whole genome sequencing may impede the segment growth up to certain extent during the forthcoming years. 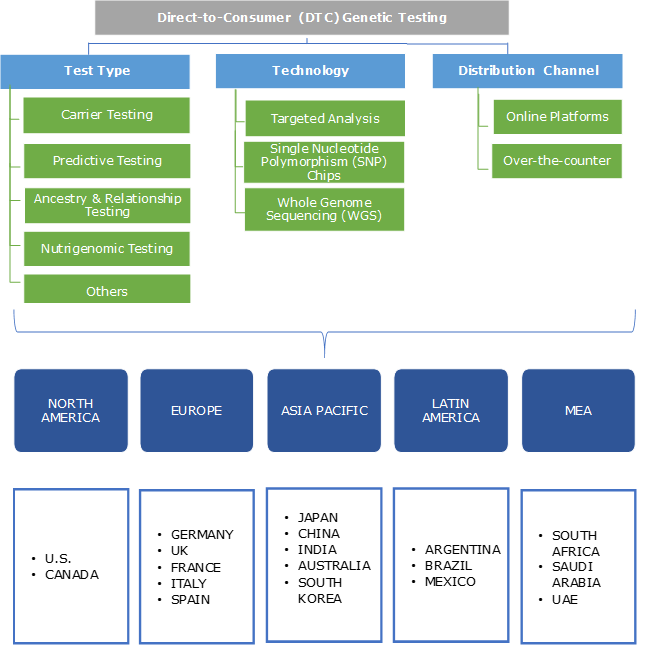 North America DTC genetic testing market dominated the global market with more than 38.0% revenue share in 2017 and is expected to witness similar trend over the analysis period. The high growth is attributable to growing incidence of genetic diseases including cancer, neurofibromatosis, spinal muscular atrophy and Turner syndrome in the region. Development of novel tests for prediction of potential allergies, responses to medications as well as risk of cardiovascular and other diseases will augment the demand for DTC genetic testing. Moreover, awareness among people pertaining to their health coupled with favourable regulatory scenario for DTC genetic testing will further foster market growth in the foreseeable future. Europe market is estimated to show lucrative CAGR of 18.3% over the forecast timeline attributable to rising prevalence of several types of cancers in the region. Hereditary cancer is one of the leading causes of morbidity and mortality in the region. DTC tests help in recognizing genetic predisposition to multiple diseases including cancer, diabetes and Alzheimer’s. Thus, adoption of direct-to-consumer (DTC) tests for early diagnosis and prevention of various genetic diseases should augment the regional growth during the forthcoming years. Some of the prominent industry players operational in direct-to-consumer genetic testing market include 23andMe, Ancestry, Color, EasyDNA, Family Tree DNA, Full Genomes, Genesis HealthCare, Helix, Identigene, Karmagenes, Living DNA, MapMyGenome, MyHeritage and Pathway Genomics. Major industry players are primarily focusing on strategies including new product launch, mergers, acquisitions and collaborations to strengthen existing product portfolio and capitalize on market share. For instance, in October 2015, 23andMe announced the launch of Personal Genome Service (PGS), an experience that includes wellness, carrier status, trait and ancestry reports. The strategic move aimed at delivering more tools, insights and better functionality through this service to ensure revenue growth. The history of direct-to-consumer genetic testing can be traced back to the early 2000s. These tests enabled consumers to access their genetic information without the involvement of a physician. The early models of DTC popular with consumers, were involved in certain medical and regulatory controversies. Few years later, FDA shutdown some DTC genetic testing companies as this type of testing posed certain risks to consumers. Despite of the concerns about clinical and analytical validity of DTC genetic tests, objections to DTC testing based on concerns about consumer anxiety as well as negative changes in health behaviour appeared to be exaggerated. Later, FDA classified DTC genetic carrier screens under lower-risk devices. This opened the way to DTC genetic testing for additional receding conditions in the future. The recent models of DTC genetic testing focus on the need to ensure consumer safety while rendering them potentially beneficial and highly desirable to the consumers. This industry is expected to witness rapid growth in the future owing to growing physician adoption of DTC testing into clinical care coupled with availability of regulatory support for DTC testing and ongoing advancements in technology.?????? ?